Power and Water has teamed up with the Yuendumu community and PAW Media to create a documentary entitled ‘Water is Life’, educating communities about the importance of reducing water use. Featuring members of the Yuendumu community, the documentary explains how people used to find water in the bush, how today the community’s water is sourced by Power and Water and why it is still important to take the same care to protect water supply. Yuendumu has a limited water supply which isn’t replenished and in recent years it was identified that the community’s water demand was at a critical point. The aim of the project has been to reduce the community’s overall water use and water wastage in order to extend the life of the current supply. The Power and Water team has been working collaboratively since 2014 to roll out the program with members of the Yuendumu community, including community leaders and residents as well as government and business stakeholders. Along with the documentary, a television community service announcement was filmed in Yuendumu with local people. Other strategies include community-wide education with businesses, government and non-government organisations and the installation of smart water meters to measure water use patterns and identify water leaks remotely. Power and Water will continue to work with the community and stakeholders to make further savings to ensure safe and reliable water supply. The six-minute piece will be screening on ICTV across the Northern Territory over the next year. View the documentary here. 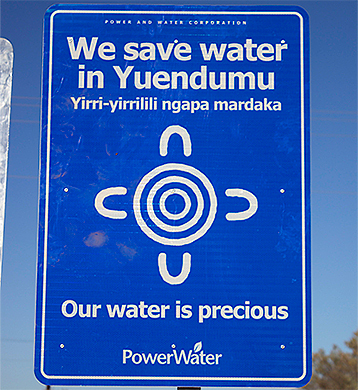 Power and Water have teamed up with the Yuendumu community to educate people about the importance of reducing water use.